Every year from mid August to mid October, Humpback whales pass close to Bundaberg's coastline en route to the blue waters of Platypus Bay at the northern end of Fraser Island. 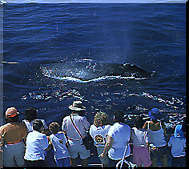 Whale watching cruises operate from Port Bundaberg during the season and they can also be seen from Lady Elliot Island. Humpbacks are curious animals and sometimes approach close to boats. They frequently give awesome displays of breaching, spyhopping and tail and fin slapping. Bundaberg's affair with these migratory mammals finds its focus in a spectacular six story environmental wall mural located in the CBD in Bourbong Street. 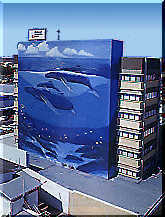 Wyland, the U.S. artist famous internationally for his whaling walls painted the wall as his gift to the city. At nearby Mon Repos beach some special marine visitors have established Australia's largest and most accessible turtle rookery. 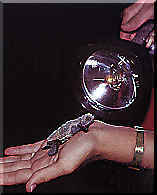 Loggerhead, green, leatherback and flatback turtles come ashore from November to February to lay eggs. The tiny hatchelings may be seen emerging from their sandy nests from early January until March. Mon Repos is 14 kilometers from Bundaberg along Bargara Road. The area is an Environmental Park designed to protect the turtles, ensure their ongoing use of the area and provide opportunities for turtle watching. 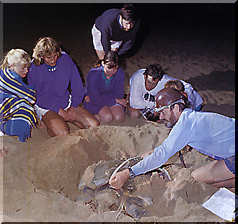 Access to the beach is limited during the season and rangers conduct guided walks each night. A new visitor centre has been opened by the Department of Environment & Heritage at Mon Repos to give an understanding and appreciation about turtle biology, behaviour and management through displays and audio visuals.